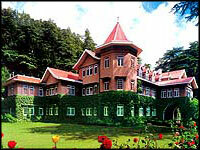 About Hotel:The palace is one of the finest places to stay in Shimla.Woodville Palace is located in four acres of peace, solitude and is only half a mile from the bustling Mall. Description:The palace is one of the finest places to stay in Shimla.Woodville Palace is located in four acres of peace, solitude and is only half a mile from the bustling Mall. In between Raj Bhawan and Chief Minister’s House.